That’s what I felt about halfway through Sunday night’s sold-out Fleetwood Mac show at KeyBank Center, at the moment when I realized that the band sounded pretty fantastic in its latest guise, and that the “new blood” on the stage was making the music and the people playing it sound fresh, rejuvenated and at times even inspired. I should have been happy that “new guys” Mike Campbell (Tom Petty and the Heartbreakers) and Neil Finn (Crowded House) had been rather seamlessly integrated into the ornate, soulful rock and pop that are the Fleetwood Mac stock in trade. But what I felt, mostly, was guilt for being so easily won over by this Lindsey Buckingham-less version of the band. The guitarist/vocalist/producer/songwriter and general sculptor of the Fleetwood Mac sound since the mid-’70s, Buckingham was rather brutally fired from the band prior to this 50th anniversary tour’s commencement last year. As a serious fan of his work, one who acknowledges that Buckingham’s vision played a big part in the multi-platinum, career-defining success of the “Rumors” album, I felt duty-bound to mourn Buckingham’s fate and, as unflattering as it is to admit it, was hoping that his absence would be noticeable, obvious and immediately felt. But it really wasn’t, so much. Guitarist Campbell and vocalist/guitarist Finn sounded fantastic, as if they had been playing with the Mick Fleetwood/John McVie/Christine McVie rhythm section for decades, rather than months. Finn’s still-strong and soulful tenor worked wonders on the songs Buckingham used to sing and fit into the Christine McVie/Stevie Nicks harmony blend (aided by a pair of background singers) with graceful ease. Campbell’s instantly recognizable blend of gritty garage blues and soulful, elegant and often elegiac melodic lines made the jump from the late, lamented Petty’s band to Fleetwood Mac with conviction. It all worked, and well, for the two-plus hours the band was on stage. 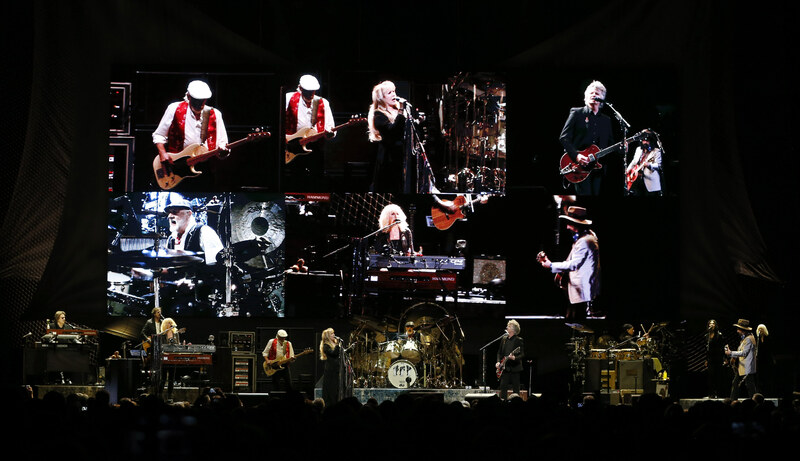 It helped that Fleetwood Mac is sitting atop a catalog of songs that refuse to bow to the brutal reality of aging. From the mildly sinister, slow-boiling invocation of opener “The Chain,” through a 21-song set that included much of the 1970s/’80s music that Buckingham either wrote, sang, co-wrote, arranged or produced, and even in such tireless anthems as “Go Your Own Way” and “Don’t Stop,” the band proved that the songs and the sound – that laid-back marriage of California pop and British soul – transcend the people playing and singing them. Nicks, who will be inducted into the Rock and Roll Hall of Fame on March 25 for the second time – this time as a solo artist – seemed to be the primary focus of the packed house’s attention throughout. Her features – the woozy “Dreams,” of course, the leather-and-lace-clad “Rhianon,” the folksy “Landslide,” the desperate, keening “Gold Dust Woman” – brought raucous ovations from the crowd, and her mildly gothic presence remained a focal point whenever she was on the stage. 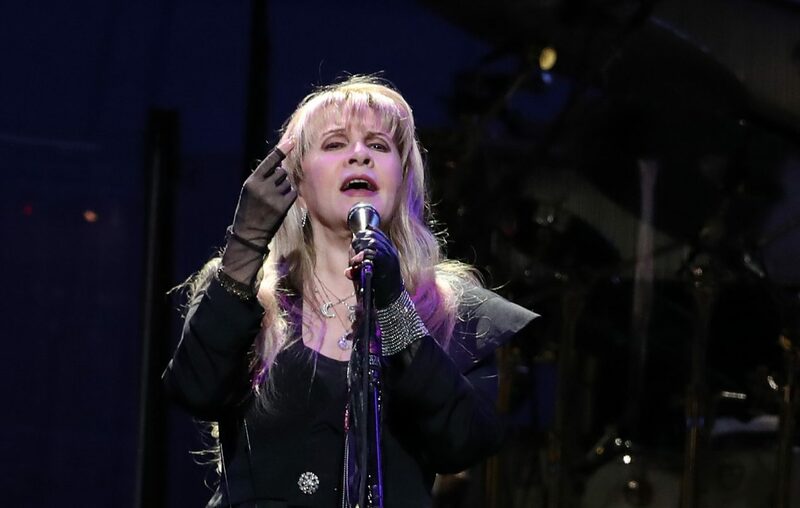 None of this was new – Nicks has been doing these songs in pretty much the same way since Fleetwood Mac returned to the concert trail after a hiatus, beginning in the mid-90s. However, a spirited arrangement of the Peter Green-era Fleetwood Mac tune “Black Magic Woman” was indeed new, and acted as one of the set’s high points, Nicks’ at times weathered voice ably serving the tune’s hard-blues structure, which she approached from the first-person point of view of a woman. (“I’m a black magic woman,” she sang, truly making the song her own.) Campbell and Finn were all over this one, their layered guitars celebrating the Green-era of the band with fire and fury. Campbell did the same during a stomping take on Green’s “Oh Well,” a tune he played often with Petty and the Heartbreakers. Christine McVie sang in her gorgeously languorous style throughout, her voice sounding as strong as ever as she led the band through “Say You Love Me,” while her e-husband John McVie laid down the song’s indelible bass line hook behind her. Finn – who, let’s face it, had the toughest gig of anyone on stage, as he was largely fulfilling the role previously held by Buckingham – was granted a well-received solo spot for a stirring take on the Crowded House gem “Don’t Dream It’s Over,” with Nicks thrilling the crowd when she emerged to sing the song’s second verse. These disparate parts should have ended up forming what was essentially an amazing Fleetwood Mac tribute act, performing a Vegas-style career retrospective. Yet somehow, this version felt like a real, honest-to-goodness band, and a revitalized one at that. The Buckingham fan in me protested. But that protest was in vain. Copyright © 2019 The Historic Cobblestone District | All Rights Reserved | Web Design in Buffalo by Abbey Mecca & Co.